The KRB EvacuBin material handling system allows bundles to be accumulated from a shearline prior to discharging them onto a runout conveyor or bending line. Each bin pocket can be dumped independently of another, allowing bundles to be accumulated, optimized, and evacuated at the operator's command. 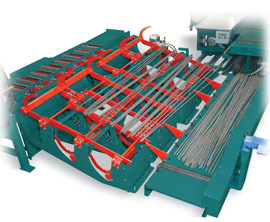 This flexible system eliminates the need to bend the bars in the sequence in which they were cut. Attached to the EvacuBin is an auxiliary runout conveyor that lifts the bundles to be conveyed back to the appropriate transfer height. This LiftRoll Conveyor allows the shearline and pockets to work from floor height without the need to raise the shear and add costly work platforms. Downstream operations can be fed directly by the LiftRoll runout conveyor.